“The stunning vistas of the Rocky Mountains reveal a dark and deadly side in this brilliantly conceived thriller about family ties and the fight for survival. Descent, the story of a family undone by the disappearance of a daughter who went out for a morning run and didn’t come back, is stunning in its emotional impact–a compulsively readable page-turner with a strong literary sensibility. The girl’s vanishing–on a sunny, late-summer vacation morning–all the more devastating for its mystery, is the beginning of the family’s harrowing journey down increasingly divergent and solitary paths, until all that continues to bind them to each other are the questions they can never bring themselves to ask: At what point does a family stop searching? At what point does a girl stop fighting for her life? During a family vacation in Colorado, eighteen-year-old Caitlin Courtland and her fifteen-year-old brother, Sean, depart from their family’s motel rooms early one morning and travel up into the nearby mountains – Caitlin, running, and Sean on a bicycle. Later that day, Grant and Angela Courtland receive a call from the local sheriff that Sean is in the hospital after an accident – and that Caitlin is nowhere to be found. What follows is the aftermath of that horrific summer day; how each remaining member of the Courtland family mourns and copes with his or her loss in their own way, not one of them able to heal without the certain knowledge of Caitlin’s fate. Tim Johnston masterfully weaves his tale, caringly surveying the emotional wreckage of his characters and skillfully crafting the rise and fall of action and suspense. The family bond shared by the Courtlands has been shattered, sending them upon varying paths with reactions both expected and unexpected, and equally heart-wrenching. Grant’s anger and devastation, Angela’s retreat into her own mind, and Sean’s urge to flee hit readers right where it counts. I rejoiced that no loose ends were left to niggle at my mind as I lay in bed after finishing this novel, which one often comes across when literary fiction attempts to cross with a thriller. 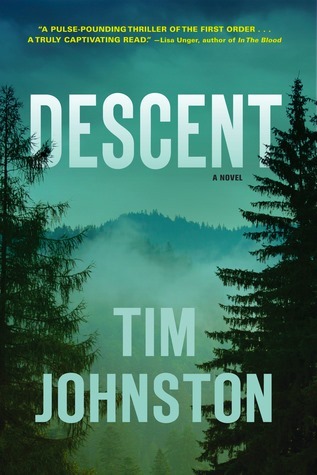 Descent by Tim Johnston is a book everyone seems to be talking about these days. It appears to be a “love it or hate it” type of tome – so of course, I fell right in the middle. Trust me to buck the system, right? The truth is, sometimes a book draws you in so thoroughly, that you find yourself immersed wholly in its world. All readers hope for that every time they open the cover of a new one. And while that didn’t happen for me here, it did for many readers of this novel. I urge you to find out where you stand. Descent by Tim Johnston: Read it today!